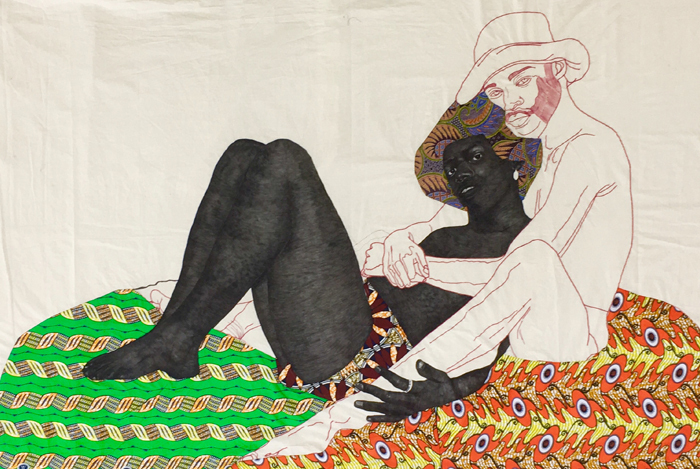 The 2017 winner of the churchie national emerging art prize (‘the churchie’) is Pierre Mukeba for his series of six large-scale figurative textile paintings. Taking a critical view of the social, political and cultural perspectives of African—specifically Congolese—culture, his work focuses on what he endured as a child growing up in Central Africa in the shadows of civil war, before being granted asylum in Australia in 2006. Mukeba’s candid works depict figures who gaze back at the viewer, challenging them to look into the subject’s eyes and see the trauma of their experiences. Working with brush pen and fabric appliqué on cotton, the artist favours a restricted palette of three colours: red as associated with war, strength and power; blue to represent piety and sincerity; and yellow to represent happiness and joy. Guest judges Aileen Burns and Johan Lundh, Executive Directors at the Institute of Modern Art (IMA), awarded the non-acquisitive prize money of $15,000 sponsored by Brand + Slater Architects at the opening of the finalists’ exhibition at Queensland University of Technology (QUT) Art Museum in Brisbane on Saturday 11 November. Burns said, “Art is about seeing the world in new ways, and artists often bring new perspectives. Pierre’s work stood out as incredibly mature, developed, and visually striking, and for those reasons it was a clear winner for us”. Lundh commented that no matter what stage of their career an artist is in, “If you have something important to say, you have to say it in a way that makes people listen, and I think Pierre has done that”. The new Special Commendation prize of $5,000, sponsored by NK Orthodontist, was awarded to Hayley Millar-Baker for her series of three photographic collages, Even if the race is fated to disappear (Peeneeyt meerreeng / Before, now, tomorrow) 2017. Two artists each received a Sam Whiteley Memorial Commendation of $1,000, sponsored by Madison Cleaning and Painting Services: Abdul-Rahman Abdullah for his wooden sculpture, The boy who couldn’t sleep 2017; and Joy Ivill for her textile works, It’s over, we’re cactus 2017 and Dubuffet’s men 2017. Established in 1987, ‘the churchie’ has developed as one of Australia’s ‘to watch’ prizes, promising a glimpse into the future of the nation’s contemporary art scene. In 2017, as ‘the churchie’ celebrates 30 years, QUT Art Museum has taken on the role of exhibition partner for the second year in a row. Throughout the exhibition process, artists worked closely with the exhibition curator to bring a selection of their works to the public. “It was important for us to present the artists’ works in context so that Aileen and Johan could have a good understanding of each artist’s practice. This really enhanced the quality of the exhibition, and I’m sure made the judging process all the more challenging,” said Kevin Wilson, Curator, QUT Art Museum. The prize aims to offer tangible support, nurturing and encouragement to a new cohort of emerging artists. This is particularly important as, like so many prizes, ‘the churchie’ has become embedded as a rite of passage for artists, as they move through their career to more substantial roles and opportunities, creating and innovating in this country and abroad. From over 900 artworks submitted from around 400 entrants, 30 emerging artists were selected as finalists for ‘the churchie’ in 2017. Finalists were selected by a panel comprising Vicky Leighton, Head of Art, Anglican Church Grammar School; Abigail Bernal, Assistant Curator of International Art at QAGOMA; and Kevin Wilson, Curator, QUT Art Museum. An exhibition of the finalists’ work can be seen at QUT Art Museum in Brisbane until 17 December. Pierre Mukeba’s practice takes a critical view of the social, political and cultural perspectives of African (specifically Congolese) culture. His work focuses on what he endured as a child growing up in Central Africa in the shadows of civil war, as well as the injustice and lack of recognition that the people of Africa continue to be subjected to on a daily basis. Born in 1995, Mukeba was forced to flee the Congo at an early age, and spent time living in a refugee camp in Zambia, then briefly in Zimbabwe, before being granted asylum in Australia in 2006. Mukeba uses a restricted palette of three colours: red as associated with war, strength and power; blue to represent piety and sincerity; and yellow to represent happiness and joy. He notes that his artworks contain a lot of red, as he feels it best represents the emotions and lifestyle that the people in Central Africa experience daily. Mukeba’s candid paintings give the viewer a rare first-hand insight into the turbulent times in Africa as they look into the eyes of his family members and see the trauma of their experiences. Born in Victoria, Hayley Millar-Baker is of Gunditjmara, Brazilian, Anglo-Indian, and European (Scottish and English) descent. Her practice is influenced and informed by her Koorie heritage and her own experience existing in a colonised contemporary urban culture. Hayley’s connection to culture is inherent to her art practice, which explores themes of displacement, alienation, suppression, and representations of Indigenous presence. Through her practice, she aims to open up gateways for new narratives to take form. Her work addresses the dispossession and disconnection to land that First Nation peoples have experienced as a result of colonisation in Australia. Even if the race is fated to disappear (Peeneeyt meerreeng / Before, now, tomorrow) 1, 2 and 3 explore contemporary Indigenous connection to land and identity post-colonisation. The artist makes digital collages of different landscape imagery to create imagined landscapes that embody both birth country and ancestral country, in order to signify urban Aboriginal identity in post-settled Southeast Australia. Abdul-Rahman Abdullah is a Western Australian artist whose practice explores the different ways that memory can inhabit and emerge from familial space. Working primarily in sculpture and installation, Abdullah draws on passages of personal history, articulating formative experiences of individual identity within the broader scope of family. Expanding on the narrative capacity of animal archetypes, crafted objects and the human presence, his work aims to create a physical dialogue between the natural world, politics and the agency of culture. While his own experiences as a Muslim Australian of mixed cultural heritage provide a starting point, Abdullah negotiates shared understandings of individual identity, new mythologies and marginalised social outlooks in a multicultural context. The boy who couldn’t sleep explores childhood experiences of nightmares, fear and phobia through the cultural prism of a Muslim kid growing up in urban Australia. Embracing fear becomes a coping mechanism—imagining oneself as the monster within is a way of renegotiating and controlling our relationship with night terrors. Joy Ivill is a confessional artist who draws upon emotionally and psychologically significant aspects of her life to inform her work. For Ivill, embroidery is a cathartic process through which she deals with difficult early life experiences while growing up at Maroubra Beach long before it was gentrified. After training in sculpture, performance and installation, and researching the methodology of sculptor Louise Bourgeois (who turned to textile art in her later years), Ivill taught herself to embroider and incorporated the practice into her art. Dubuffet’s men draws from the imagery of French artist Jean Dubuffet. Ivill took an image of a man who was reminiscent of her father (whom she barely knew) and painted the image repeatedly until she had depicted a large group of men. She then went over the image in fine embroidery. Embroidery is a medium loaded with implications of gender and the domestic domain, providing a rich landscape against which to contrast subversive concepts. Ivill’s embroidered and appliquéd artworks depict unexpected images together with poignant and often humorous text. The images are meant to charm, unsettle, surprise and challenge preconceptions of traditional needlework. A sense of subversion is at the crux of her practice. Image: Pierre Mukeba, James 2:10 (detail) 2017, brush pen and fabric applique on cotton, 182 x 290cm. Courtesy of the artist and GAGPROJECTS, Adelaide.